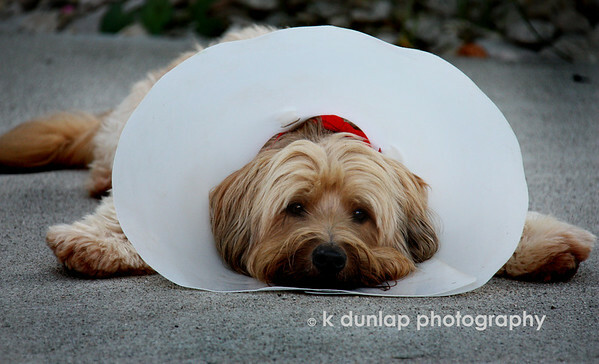 09.17.09 = Sorry Digby, but you have to wear the cone. I don't think he really minds it all that much that's just his pity look. It's that time of year for allergies and this poor little guy just can't stop licking and biting his feet, so he has to wear the cone. The Digger is my sister Kasey's dog. He is a little over 10 now and such a sweetie. We call him a "Blarney Terrier" We think he is mix between a Wheaten Terrier and a Golden Retriever. He is a gentle soul. Thank you to all who voted for Gracie yesterday! Wow, was I surprised when I got home last evening to see her mug as the No. 1 daily yesterday! That really made my week! He looks resigned to it! Great shot! Awww... such a cute sweet shot! Awwww, how adorable! I love the legs splayed out, like "oh the indignity of it all ...."
and a great 'pity look' it is!